Yesterday, Emmett and I ventured into the Big Apple… and stumbled across actual apples, not to mention apple cider (which we purchased and swigged straight from the half-gallon jug), apple sauce, and hundreds of varieties of non-apple fresh produce. We were there on business, meeting with our literary agent on Fifth Ave. to finally put a face to someone we’d only interacted with via email or phone. She was the one who pointed out her eleventh-floor window down the block to Union Square, where literally thousands of customers were flowing in and out of a farmer’s market like so many tiny, hungry ants. After the meeting, we dove straight into the anthill — and were shocked at the wildly different prices we found there. Let’s start with the radish. Our radish bunches were put firmly to shame: at the Migliorelli Farm stand, you could purchase twenty radishes for $1. (Remember, we charged $1.50 for half that many.) But the same stand was charging $2 for small and — I say this with all due affection and understanding about perishable greens and farmer’s markets lack of refrigeration — very wilted, sad-looking chard. So even if my radishes are overpriced, my chard bunches are a pretty good deal. 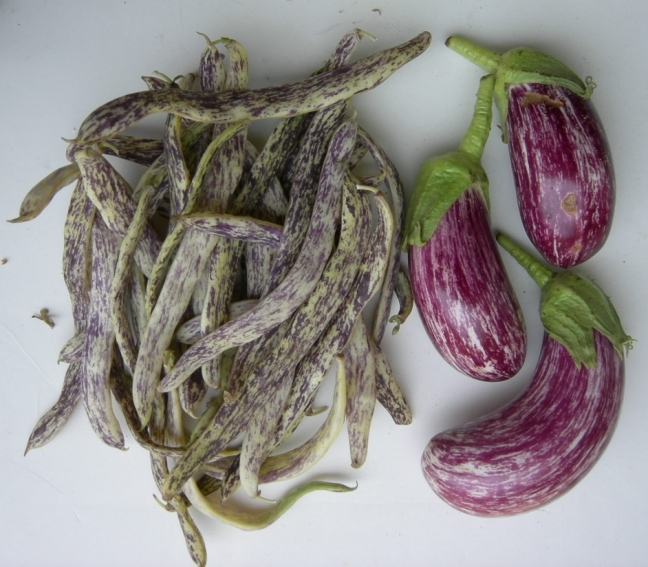 There were other interesting things at the farmer’s market: dragon’s tongue beans, which are unbelievably cool looking. These guys made my purple beans feel mundane! Dragon’s tongues are flecked with yellow and purple in a psychedelic spattered-paint theme. One last humbling thought: one of the farmhands we talked to said that on a good Wednesday market day, they’d sell $5,000 worth of produce. Saturday markets can bring in $7,000. (Suffice it to say that Emmett and I are so far from even cumulatively earning $5,000, it isn’t funny.) The seller also suggested that the biggest stands can bring in $25,000 on one day — but of course they also employ something like 60 workers, so while their income is sky-high, so are their costs. If all of this makes you want to get into the Union Square market to sell baby greens for $12 per quarter pound, good luck: getting a stall is practically impossible. It’s a very carefully-managed market, so there are are rarely more than 2 vendors selling the same specialty item. (Course, lots of folks have tomatoes and zucchini right now, but try finding multiple cider sellers or goat cheese vendors.) According to some of the farmers we spoke to, the only way to get in is: come up with something that nobody else is selling — again, good luck — or start selling at other Greenmarket farmers markets around New York (there are 46 locations, with over 250,000 customers each week) and wait, hoping that someday one of the Union Square vendors (some of whom have been selling for decades) decides to call it quits and you can sidestep in.